Use this page to get insights about what to do when your work is being copied. DISCLAIMER: BY USING THE INFORMATION IN THESE PAGES YOU AGREE THAT YOUR USE OF ANY INFORMATION CONTAINED HEREIN IS DONE AT YOUR OWN RISK. 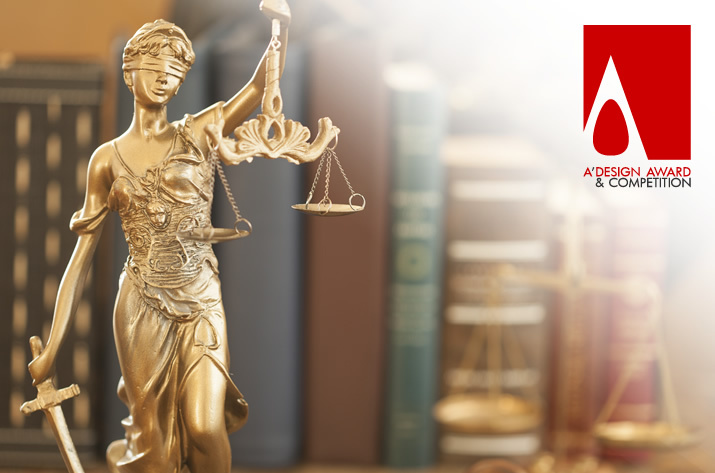 A’ DESIGN AWARD IS NOT A LAW FIRM AND WE ARE ALSO NOT LIABLE FOR ANY DAMAGES THAT COULD RESULT FROM YOUR USE OF THE INFORMATION IN THIS PAGE. THIS PAGE DOES NOT CONSTITUTE LEGAL ADVICE, ALWAYS CONSULT A LAWYER IF YOU HAVE ANY QUESTIONS OR COMMENTS. PLEASE KINDLY NOTE THAT USING INFORMATION IN THIS PAGE DOES NOT CREATE AN ATTORNEY-CLIENT RELATIONSHIP. Pablo Picasso is widely quoted as having said that “good artists copy, great artists steal.” Many people misinterpret the idea and outright steal ideas and designs and present as if it is their own, we hate these people. If your award winning idea or design is stolen by another company, we advise you to send the company, as well as the platform where the stolen designs are displayed and any eventual company, reseller, distributor, or marketer of the stolen work a Cease and Desist Letter. Sometimes, these platforms might have a dispute process where you could send a notice together with proof, therefore it is better to send an email to the legal departments when such think happens. 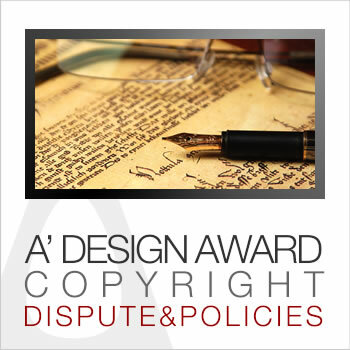 On the other hand, If you believe an A' Design Award winning idea or design is a blatant copy or imitation of your work, please welcome to initiate a Copyright or Patent Dispute Process. We take these very seriously at A’ Design Award. Before proceeding with legal action, consider if it is worth it; for some people it is a matter of principles, so they are ready to pay tens of thousands of euros to take action with little or no returns possible. If you win any eventual court, you might recover a portion of your legal fees but these fees might as well double if you lose the court; and if you are made to also pay for the legal fees of the defending party. Usually, you should decide based on: 1) Do you have a good case? 2) Do you expect a return? If the design is exact and identical, you might have a case, especially if your work is being used for commercial gain. For artworks, photography, illustrations and literature, you do not need a patent to have a case; any original content you create is automatically entitled to copyright protection. For industrial designs however, you might need to have a patent; if you do not have a patent, you do not have a case in most cases; except perhaps for artistic creations such as sculptures. If the design is not exact, you might not have a case at all; even though we all find that it is not ethical to just steal the overall idea; the world system allows it; because the overall legal system worldwide favours exchange of ideas over strict idea protection, in order to not to create a burden for swift industrial development. If it is a big company with a lot of money, you might expect a return; they might pay you money for the alleged damages, however a smaller company might not even have the money to pay you; so even if you would win a case, you might find yourself in a situation where you got nothing; plus you still have to pay for the legal fees. This happens a lot; also because sometimes it is not also possible for the court in your country to enforce the company in another company to pay for damages. Sometimes, the returns or damages even if awarded and enforceable could be relatively small and not enough to cover the cost of opening a case, so you must think a lot about it. If your work is registered copyrighted work or patented design you have potential to demand reimbursement if third parties are using it commercially (such as reprinting or reproducing), but if you have non-registered copyrighted work or non-patented design you might probably not be able to demand a reimbursement. In any case, it is usually possible to send a Cease and Desist Letter right away (afterwards sending an informal request first, the Cease and Desist letter asks the third party to stop using your copyrighted data) and in most cases, without paying any advocate, court or legal fees, you might arrive at a simple resolution such as having the infringing content removed from a webpage. In most cases, before sending a Cease and Desist letter, you can actually send a kind and polite letter which might even be more effective for some publishers and platforms. Who to Send Cease and Desist Letters: If the company has a legal department, or a dispute process, or takedown process use these processes first. If the company does not have such a process, find their contact details from whois information or their contact pages. Once you find the contact information, you will send a Cease and Desist Letter or Takedown Notice (Takedown Notice are send to platforms that host third party contents; you send Cease and Desists Letters to infringing parties but if a company is just hosting a third party content then you send them Takedown Notice instead). What to write: In your letter, tell that you are the copyright owner of the design, attach proof that you had designed this design in the past; for example your design award status could be useful for proving that you have designed the work, and of course you can even state that you have a proof of creation document if you have one. Explain that your intellectual property is an important and valuable asset that you are willing to protect, if necessary by taking legal actions. Request a reimbursement amount if you think it is necessary. Provide a deadline for response. Demand and request removal of the work from any websites, catalogues etc. Advise that you keep your right to commence and proceed with legal action. Provide Exhibits In Your Letter: 1) The contact information of the infringing party. 2) Printouts of the website (or catalogue) showing the copyright infringing material. 3) Any proof that you demonstrate that you have the rights to the design (such as award certificate, proof of creation documents, affidavits). Finally, also remember to add your signature, name and address. Send your letter as a certified letter with return receipt, not as an email, so that people know you are very serious about this issue. You can search for copyright infringement templates in search engines if you need further help. Even if you are most likely not going to collect damages, it is good to send this letter as the infringer may be scared enough to remove the infringing work. In most cases, the infringers might just ignore your letter, if they ignore you, keep contacting other people in their organization and create a pressure. Remember to show good will when doing all these actions; remember to go through any existing dispute procedures before proceeding with Cease and Desist letters or Takedown notices, and you could always send a first, please remove my copyrighted design mail to be extra nice; remember in many countries, especially those who did not sign the Bern Convention, copyrights are not even enforceable, so being nice can just do the work. A' Design Award and Competition is the only design accolade that offers services such as the Proof of Design Creation document that is aimed towards protecting the interest of participants.